The 2019 Ford EcoSport is a 5 passenger Automatic transmission, 2 Wheel Drive Sport Utility Vehicles or 4x4 Sport Utility Vehicles. It is available in 4 trim packages, the S, SE, SES, and Titanium. The new Ford EcoSport invoice price ranges from $19,595 to $27,057, while MSRP ranges from $19,995 to $27,610. 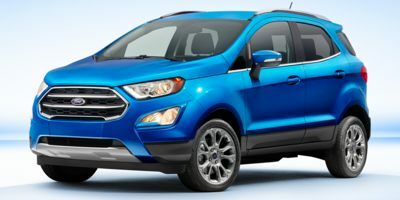 The 2019 Ford EcoSport is available in 10 exterior colors, Blue Candy Metallic Tinted Clearcoat, Canyon Ridge Metallic, Diamond White, Lightning Blue Metallic, Moondust Silver Metallic, Race Red, Ruby Red Metallic Tinted Clearcoat, Shadow Black, Smoke Metallic, and White Platinum Metallic Tri-Coat, and 3 interior colors, Ebony Black, Medium Light Stone, and Medium Stone.